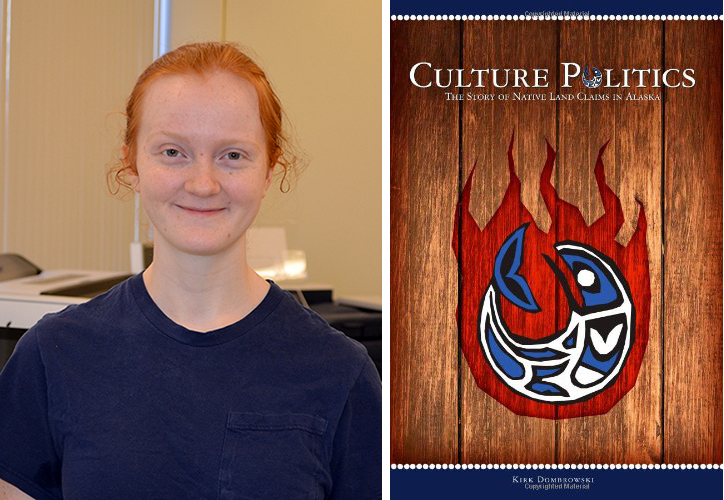 (left) Kate Rask; (right) The cover of "Culture Politics: The Story of Native Land Claims in Alaska" by UNL Professor of Sociology Kirk Dombrowski. It began as a class project for Kate Rask’s very first graphic design class in the Department of Art and Art History. It ended with her concept design being used for the cover of UNL Professor of Sociology Kirk Dombrowski’s new book, “Culture Politics: The Story of Native Land Claims in Alaska,” which was published Jan. 8 by Syron Design Academic Publishing. Rask, a junior art major from Lincoln, completed the assignment in Assistant Professor of Art Colleen Syron’s beginning graphic design course. It was the second project of the class to design a book jacket for Dombrowski’s book, which traces the history of indigenous land claims in Southeast Alaska and is a summation of his last 20 years of research. Syron directed the students through the design process and through the specific content. Syron said her students began by critically examining the relationship between form and content. The concept Rask produced included the image of a fish, inspired by indigenous artwork, on a wooden background. Over the holiday break, she received an e-mail from Syron telling her they wanted to use her concept for the book. The original assignment was for a book jacket, so with Rask’s permission, the concept was re-worked as a cover, an e-book and interior chapter headings. It was even more exciting for her parents. Rask appreciated the real-world class projects that Syron had her students complete in the class. They also created a logo and completed a magazine design in the class. “I thought she had a really good approach to her projects in that she wanted us to use real-life books or companies to make projects for us,” Rask said. Syron said real-world projects are a community service. Dombrowski said the experience of working with the graphic design students was one he would repeat. He also had the chance to learn about the design process, too. Rask’s success on this project inspires her to continue studying graphic design. Rask said she purposely waited until last Fall to take a graphic design class when the three new professors—Syron, Stacy Asher and Aaron Sutherlen—were on board as part of the Department of Art and Art History’s updating of the graphic design program. She has taken classes in painting and drawing, as well as graphic design, and intends to keep her future options open. She intends to continue building her design portfolio.